Senior Vice Dean and Chief Academic Officer Dr. Sharyn O’Halloran hosted an SPS Student Update last week. She shared the three pillars by which we have developed our graduate school into a best-in-class institution. Create a virtuous circle for faculty by engaging academic scholarship that informs teaching; teaching that enhances the practice of professions; and practical application that, in turn, reinforces scholarship. To fully take advantage of our new mission, we are encouraging students to start thinking about their relationship with the school, the university, and to a wider network of partners. SPS is in a prime position to utilize all that Columbia University has to offer—students have new networks within the school itself, powerful connections to other schools here at Columbia, and new ways to add value to the corporate world while simultaneously investing in their studies. 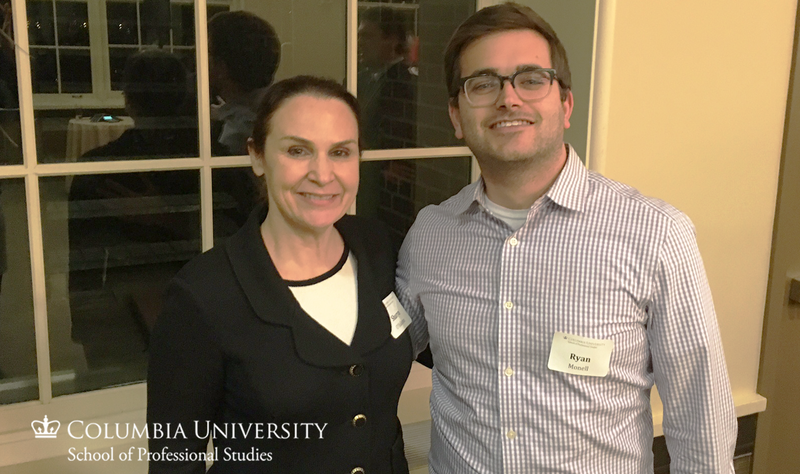 Senior Vice Dean and Chief Academic Officer Dr. Sharyn O’Halloran and Student Senator Ryan Monell. Sharyn then introduced Student Senator Ryan Monell, who announced the introduction of the first student governing body at SPS, the School of Professional Studies’ Student Association, or the SPSSA. As Sharyn says, student governments not only strengthen the collegiate experience while in school, but also help build strong ties once students graduate. I am looking forward to working with our students in the newly formed SPSSA and building on these three pillars to further enhance the School's academic excellence.